Mailplane combines Gmail�s fast search, spam protection, endless storage and unique user interface with great Mac features. And there is no need to set-up and learn another email application if you already know and love Gmail. 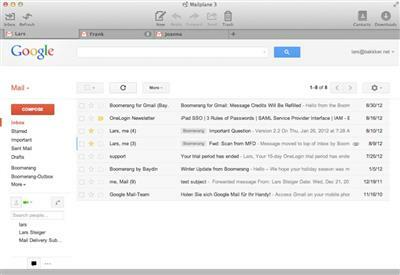 Mailplane�s notifier tells you how many unread messages are in your inboxes, right from your Mac menu bar. Mailplane also integrates with Apple�s notification center and the �Do Not Disturb� mode allows you to stay focused. � Hides ads and comes with an amazing set of productivity tools.